Let me propose there are three levels of reading that make this book pertinent, and even exemplary, for the French poststructural response to writing about visual art. 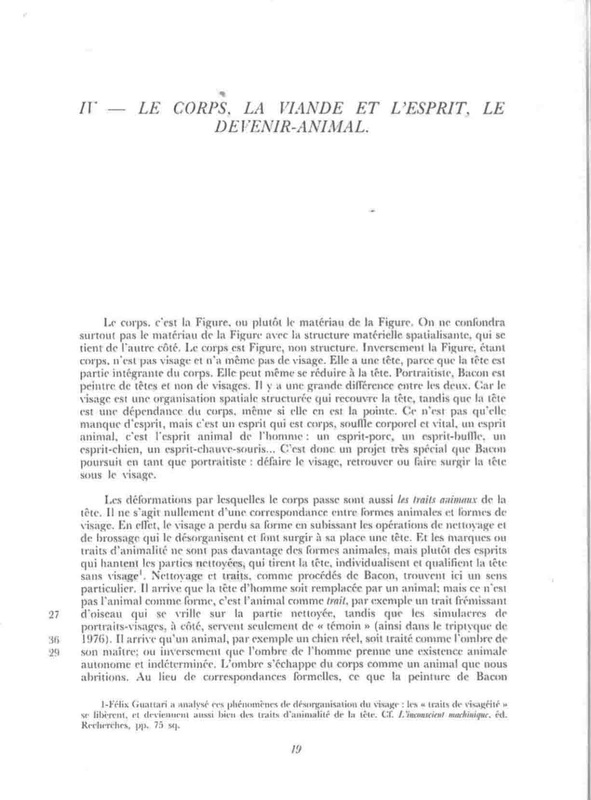 The first of the two volumes of the original 1981 edition of Deleuze's book (published by Editions de la Difference) is text, and the second is illustrations (note the Roman numeral I on the cover, above; vol. 2 is titled "II - Peintures"). Tom Conley's Afterword to the English translation is exemplary in its attention to this fact, but even Conley, who is arguably the scholar most likely to take formatting and illustrations seriously, doesn't draw many conclusions from the layout. He notes that call-outs (references to the images in the second volume) are placed in the margins, "somewhat like title-summaries in manchettes in early-modern printed books, in which the text itself can be seen at once as a 'legend' underwriting the images or even as a component unit of a greater 'fable' built upon the composite character of words and pictures" (p. 131). Part of Conley's gloss on the "manchettes" (marginal call-outs) is plausible: the use of marginal numbers does create the effect that the text is a "legend" (caption), but for me the practice means more that the text, considered as a whole, and the images, in their separate book, are equally important, that both are continuous, and that one is not interrupted by the other. 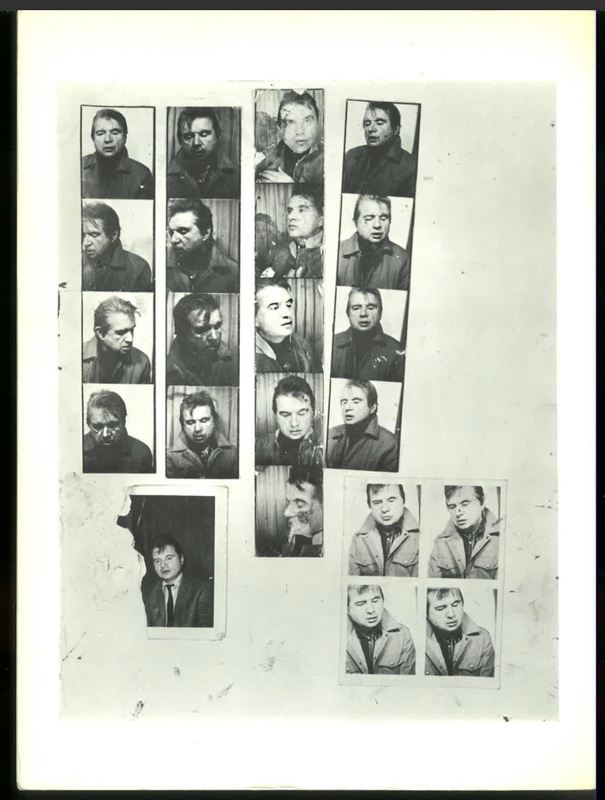 The call-outs also remind a reader that the text does not often need to specify exact images, and in fact Deleuze doesn't always say exactly what image he means: a figure number is anchored well enough if it is in the vicinity of its sentence. In the English edition, the call-outs only refer to the small-print list of plates at the end of the book, and not to illustrations; but they are in the text, in square brackets, which places them precisely in relation to the grammar of the text. In that way the logic of a given sentence, and its singular referent, are closely bound. In Deleuze's usage, the vagueness about that relation is striking. Why, a reader may ask, does it not matter exactly when images are being referred to, or exactly how many images might be meant, or when a reader might choose to look at the images? 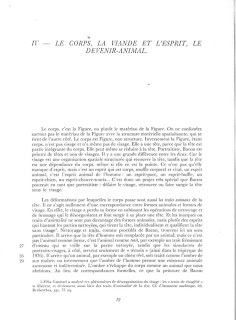 Later in the introduction, Conley guesses that Deleuze might have owned eleven paintings that were added, without explanation, to the third edition of the French text; at least Deleuze probably had reproductions on his walls or floor when he was working on the book, because "the unlinked and paratactic quality" of his observations suggest he is "telling the reader to break frequently with the line of his reasoning by looking in detail at an ample quantity of pictures" (p. 132). 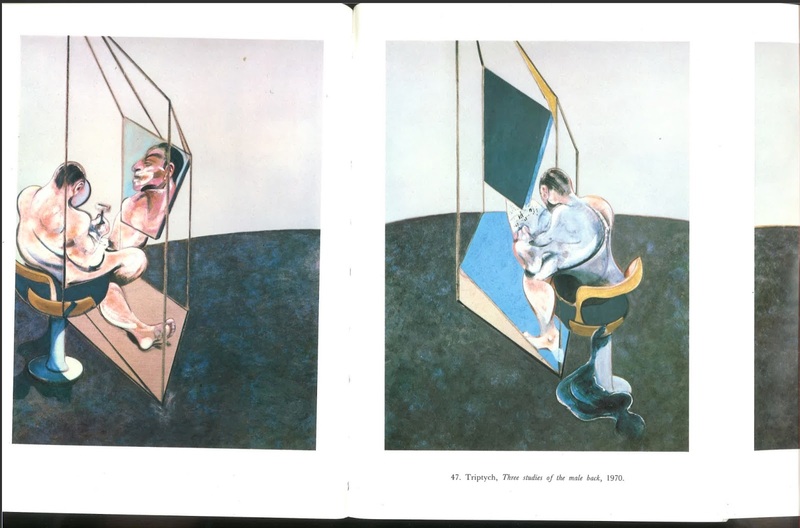 Conley also takes note of the fact that the back covers of both volumes of the original edition have photos Bacon took of himself, which makes the covers look like contact sheets, and brings the artist's body and life back into the reading—but Conley's reading stops with those observations, and he moves on to other topics (p. 142). The fundamental physical fact of the two volumes means that Deleuze's text exists alongside the paintings as a proximate but potentially detachable narrative. That property is made literal in the single-volume English translation, which is completely unillustrated and has only a list of the paintings, in a remarkably tiny font (especially minuscule in the paperback--as if the editors felt a fiduciary responsibility to list the paintings they weren't reproducing.). 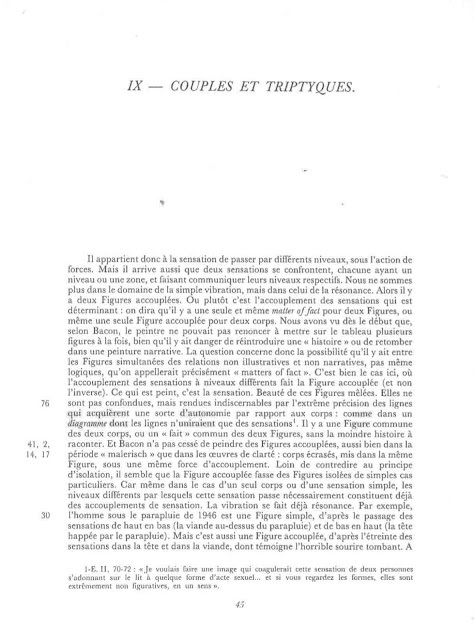 Two things become clear, I think, early on in a reading of either the French or English versions of Logic of Sensation: first, the text has an unusual form (chapters which reproduce an ascending complexity, but which may be read in any order); and second, that the unusual form is somehow motivated by the subject matter. 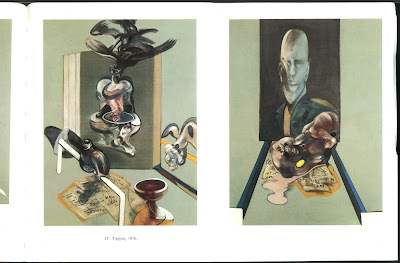 Or to put it more exactly: the unusual form of the book may be a response to the paintings, to the "logic of sensation" that the text is exploring, or to both. It also becomes evident that the author will remain silent on these points, and that he is possibly working on understanding them as he writes. The ordering of the chapters announces its open-endedness, its randomness, at the same time as its author asserts the chapters' logical order from simple to complex. This seems consistent with Deleuze's consistent lack of interest in Bacon's development, except where it serves his themes. His text is a conceptual analysis rather than a chronology or history—and in that regard it does not require the images to be arranged in any particular order. Conley notes that this open-ended and yet structured presentation is consonant with Deleuze's interest in open-ended structures of argument, totalities such as "a thousand plateaux" that "cannot be accorded a finite measure" (p. 134). These are all structural parallels between the "logic" Deleuze finds in the paintings and the text he produces. There is a strong parallel between Deleuze's central theory of sensation, which exists in levels and strengths, and comes at us with immediacy and without systematic mediation, and the chapters in his text, whose fundamentally disordered order and varying strength and concision mirror their content: the question is how to read his decision to represent the "logic" of sensation both in the structure of the text (its chapters, its "supple... flexion") as well as in the text's propositional logic (its argument). The idea of writing in a series of differentially disconnected chapters has to appear as a parallel to the book's subject matter, which is a lifetime of differentially disconnected canvases. The idea of writing about the logic of sensation in a series of differentially disconnected chapters also seems appropriate, even if its logic is harder to deduce. In general, why write using the form of the object that is being explored? Since Deleuze isn't writing under the pressure of radical claims about the relationship between written form and content, such as the ideas in Adorno's "Essay as Form," it is not clear why his writing persistently explores the possibilities of presenting itself in levels, intensities, and encounters, even as it describes those very terms. The Logic of Sensation can be read as a model of how not to write philosophy at images, or imply images are philosophy, or that they're adequately imagined as philosophy, history, or criticism: Deleuze's text refuses to be a commentary, just as it refuses physical control of the images of the sort that is implied by conventional art historical or theoretical texts that incorporate reproductions into the flow of the printed page. The writing exists alongside the paintings, both because it is physically adjacent to the companion volume, and because it thinks by enacting parallel structures of force and meaning. Sensation is immediate, it is "translated directly" (Deleuze is paraphrasing Valéry; la sensation, c'est qui se transmet directement): unlike abstraction and figuration, it does not "pass through the brain" (p. 32, p. 28 in the original). There is a problem, I think, in taking this literally. If the text was actually embodying or exemplifying sensation, it would cease to argue altogether. Yet I am continuously tempted to make a parallel between the theme of avoiding both figuration and abstraction, and Deleuze's own writing as an attempt to avoid both history and philosophy. A useful vehicle for this parallel is Deleuze's notion of the Figure. The liberation of the Figure from figuration enacts the liberation of writing from description, history, theory, and criticism. 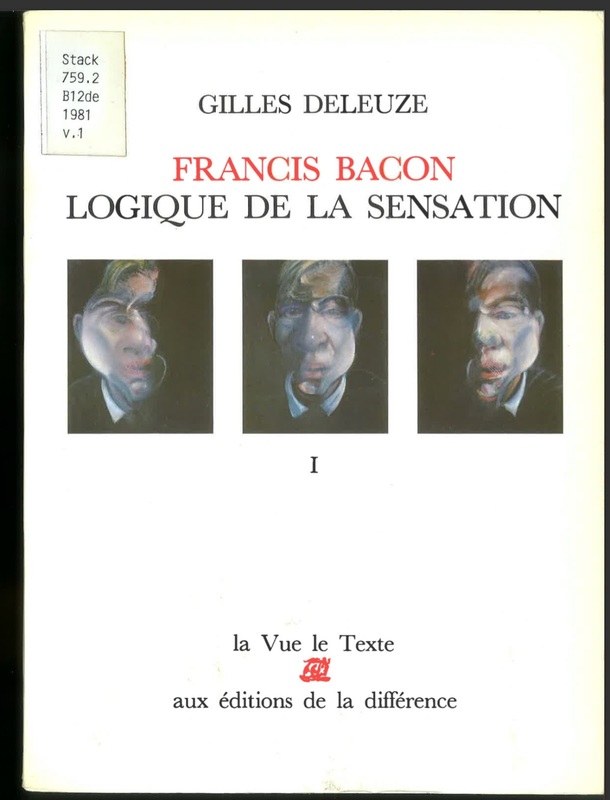 The "very general thread" (le fil très général, an odd metaphor) that links Bacon to Cézanne, Deleuze says, is "paint the sensation," in italics in the original (p. 32; p. 28 in the French). It would not be misplaced, I think, to read this phrase as write the sensation. 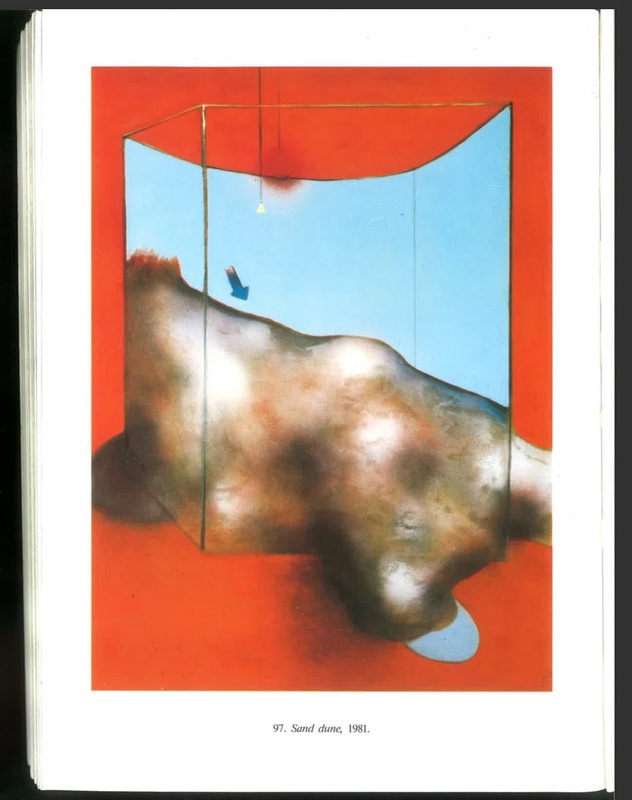 As Deleuze says of Bacon's supposedly grisly figures, "the Figures seem to be monsters only from the viewpoint of lingering figuration" (p. 123): a statement that could be made just as well about his own book. In Deleuze's critique, "there are two ways of going beyond figuration (that is, beyond both the illustrative and the figurative): either toward abstract form or toward the Figure" (p. 31). 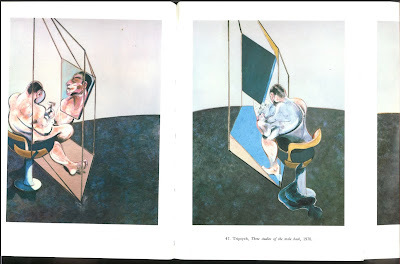 The Figure is a direct record of sensation, the object of Deleuze's study, and its "logic" involves such things as color, the frame, the contour, and other elements that are the subjects of The Logic of Sensation. It wouldn't be inappropriate to read this passage, and Deleuze's subject in general, as an allegory of his own sense of what it is to write philosophy to one side of painting or literature, rather than for or as painting or literature. 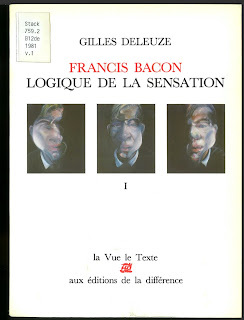 As Conley says, Deleuze's style "becomes the very image" of his experience looking at Bacon's paintings: it is meant to stand along with his experience of the art, just as the first (unillustrated) volume of the French original edition stands alongside the second volume of plates. I propose that this passage, this sense of the Figure in the text, both in Proust and in Bacon, can also be understood as a story Deleuze told himself about the kind of writing he meant to accomplish. He was experimenting with writing the Figure in the text of literature: neither "too voluntary" nor merely "illustrative," but a form of escape from both that was indebted to and dependent on their continuing presence. As such it is an especially strong model for how to write about images: such writing would be a deep challenge to academic modes of addressing images, up to and including poststructural theories by W.J.T. Mitchell, Jean-Luc Nancy, and others, and it would have the interesting virtue of being not entirely easy to justify, maintain, or even understand.